You mean to tell me this ISNT a paladin card? It synergies so well with Blessing of Kings and Blessing of Might! Found out the cheapest thing ever if you have league of explorers unlocked too. 1. )make a druid deck with Arch-Thief Rafaam, Innervate, and Echoing ooze. Welp now they nerfed Innervate so Dinosize combo is the only. Why does this battlecry work with Mirror Entity and other stuff like Novice Engineer doesn't? That seems inconsistent. Mirror Entity creates an exact copy of the target. If the played minion changed itself by its battlecry, the changes are carried over. This is the same reason why Twilight Drake's copy gets the health buff. I think I'm gonna work on this today. I'm thinking a Keeper of Uldaman or two is the lynch-pin, with BoK/Avenge and the new +4/+4 deathrattle I think it could be pretty scary mid-range. First game I managed to keep a Darkbane all game with divine shields, blessing of might, and blessing of wisdom, all the while pumping out 3 dmg when I used Kings, etc. Pretty fantastic. Keep out the +4/+4 though he's too slow and easy to counter. 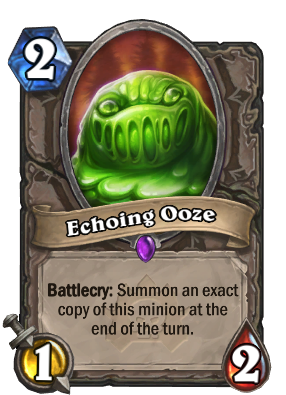 After a few games I think I've decided that the ooze itself doesn't have any tempo damage and is a pretty dead card if you get it too early or too late. No luck. Last night, I had a random game where I ended up with one of these through Thoughtsteal. Velen's Choosen, Divine Spirit, Inner Fire. I mean, it won't happen often. But boy was it funny. Hello, didnt read through all the comments but was wondering, if it says "creates an exact copy at the end of the turn" does that mean that the said copy will 1. be able to create more copies and 2. include all stat buffs applied to original? The second Ooze is an exact copy, including buffs. For example, playing Blessing of Kings results in two 5/6s at the end of your turn. However, because its effect is a battlecry, summoning it doesn't activate it (you need to play it from hand). So the second copy won't be able to summon another copy. We can add Hobgoblin to the list of cards that compliment this one.